Located corner of Public st. and State St. Beloit WI Coordinates Lat N 42:30':057" Lon W 89:02':082"
In this vicinity, during the Black Hawk War of 1832, Sac Indian leader Black Hawk and his followers left Illinois and entered the Michigan Territory (now Wisconsin) seeking refuge with the Ho-Chunk indians at Turtle Village. On July 1, 1832 more than five weeks after black Hawk left Turtle Village and continued his northern retreat up the Rock River, General Henry Atkinson and his troops arrived here, only to find an abandoned Indian settlement with extensive gardens and fields of grain. 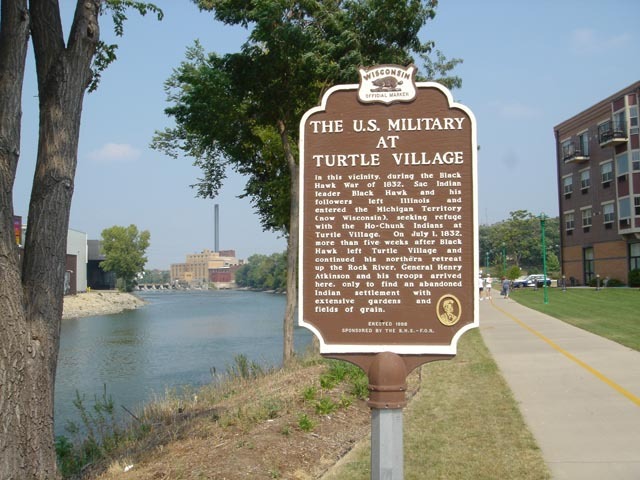 Don't forget to look at both sides of this one it two stories "Back-to-Back"
Turtle Village, a large and important Ho-Chunk (Winnebago) Indian village, once stood on the east side of the Rock River near its confluence with the Turtle Creek. During the Black Hawk War od 1832, the Ho-Chunk sheltered Sac Indian leader Black Hawk and his followers during their northern escape from the military in Illinois. 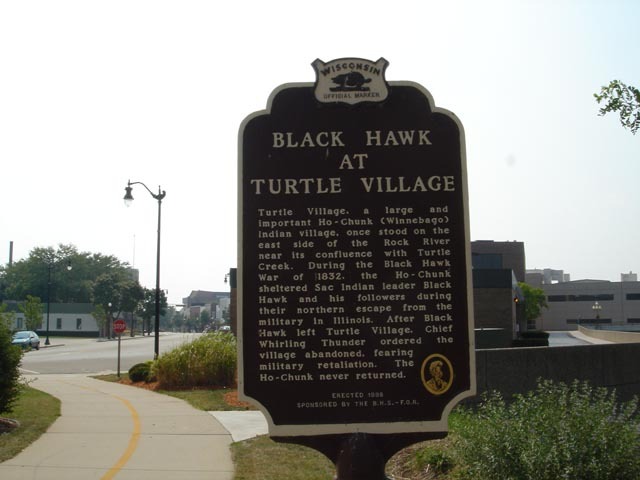 After Black Hawk left Turtle Village, Chief Whirling Thunder ordered the village abandoned, fearing military retaliation. The Ho-Chunk never returned.